Breakfast at Hotel, In time transfer to airport for flight to Chennai. On arrival meet and transfer to your hotel. Later in the day enjoy sightseeing tour by visiting Museum (Closed on Fridays and holidays). Drive through the flower and fruit market, High Court, Fort Museum, Marina Beach, San Thome Cathedral and Snake Park. Relax in the evening. Overnight at Chennai. Start after breakfast and proceed for Bangalore. The local Chieftain, Kempe Gowda, founded Bangalore in sixteenth century. But Bangalore never came up on the scene till Tipu Sultan converted it into the summer capital of Mysore. The Wodeyars also contributed in developing the city through gardens and palaces they built. To the British goes the credit of making it into an administrative center. Bangalore, the capital city of Karnataka is one of the most important metropolises of India. It is a vital centre of science, aeronautics and electronics. Situated 1000 m above sea level, this garden city has pleasant weather round the year. Later enjoy sightseeing tour including visit of The Lalbagh, one of the finest botanical Gardens of India, Cubbon Park laid in 1864 sprawling across 300 acres, Vidhana Soudha built in 1956 housing The State Legislature and Secretariat are the main attractions. Overnight at Hotel. Breakfast at hotel. Proceed for city tour of Bangalore in the morning. Drive to Mysore. En route visit Srirangapatanam. Srirangapatnam was the capital of the Mysore State under Tippu Sultan. As a result there are a number of historical monuments related to the life and times of Tippu Sultan. After the death of Tippu Sultan in 1799AD the British shifted the capital back to Mysore. Here enjoy visiting The Daria Daulat Palace, Masjid-e-Ala, Ranganthittu Bird Sanctuary, and The tombs of Tippu Sultan. Later drive to continue driving to Mysore. On arrival check in your hotel. Later in the day enjoy sightseeing to Mysore. Mysore as we see today is most famous for the imposing Royal Palace with a magnificent Durbar Hall, particularly splendid during the Dussehra Festival when the Maharaja's jewellery, studded gold throne (weighing 200 kgs) is on display. Chamundeshwari temple perched on a hilltop is 2000 years old, Nandi Bull half way to the hill is a 4.8 metre monolith. 19 km north-west of Mysore is the KRS Dam and the ornamental Brindavan Gardens. The musical fountains and colourful lights transform this place into a fairly land in the evenings. Overnight at Hotel. .
Breakfast at hotel, you can enjoy few hours in visiting Mysore. Later start driving to Kodaikanal -is one of the most popular serene hill stations in India.With her wooded slopes, mighty rocks, enhancing waterfalls and a beautiful lake, Kodaikanal will mesmerize any visitor. Kodaikanal, or Kodai is a serene hill station, set high in the Palani Hills at an altitude of over 2100 metres. Wooded hills. Pleasant walks, picturesque waterfalls and a magnificent lake, make Kodai one of the most beautiful hill stations in India. Kodaikanal is rich in flora and fauna. It has a unique plant - the Kurinji, which blossoms once in 12 years, making the hill slope a blaze of purple. The Kurinji last blossomed in 1992. Kurinji andavar Temple (3.2 kms.) : The presiding deity of the temple is Lord Murugan. From this point, one can get a beautiful view of the northern plains and Plaani Hills. Overnight at hotel. Breakfast at Hotel. Drive to Trichy. On arrival check in your hotel and later enjoy exploring the city of Trichy. Visit the ancient temples dedicated to Lord Ganapathi, 434 steps cut out into the rock side and interspersed with shrines, lead to the temple. 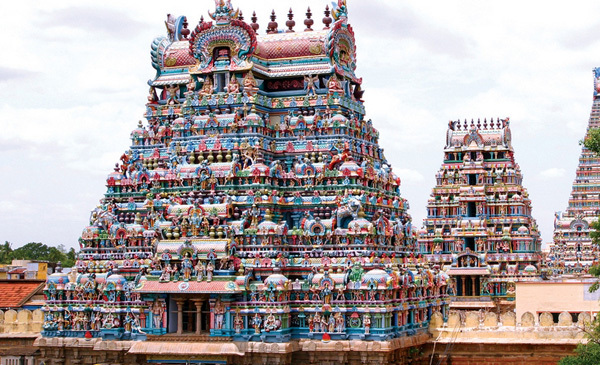 Visit Srirangam, a massive temple dedicated to Lord Vishnu sprawled on a Island in Cauvery River which contains within its walls a Bazaar (Traditional Market Of India) as well. Gaze up at the twenty-one magnificent towers of the temple surrounded by seven walls. Return to hotel. Rest of the time at leisure. Overnight at Hotel. Breakfast at hotel, later drive to Tanjore also known as Thanjavur (The rice bowl of Tamil Nadu). Proceed for sight seeing of Tanjore. Visit the famous Chola Temple of Brihadeeshwara - A World Heritage Monument. Its bronze and handicrafts make Tanjore one of the highlights of the tour to South India. The majesty of the palaces and art gallery attached to the temple is really awe-inspiring. It is also famous for the silk. Overnight at Tanjore. Breakfast at hotel. Later leave for Madurai by surface and en route visit Karaikudi (Chettinad). Madurai is over 2500 years old and is the second largest city of Tamil Nadu - Ancient seat of learning. The city is planned in the shape of a lotus. Check into the hotel by noon. Freshen up and by afternoon visit the famous Madurai Meenakshi temple (dedicated to the consort of Lord Shiva with its towering Gopurams) - There are four entrances to this amazing temple complex set in 6 hectares. Beat some of the stone pillars in the complex with any hard object and feel incredible on hearing sweet metal sounds. The total number of pillars in the temple is a staggering one Thousand. If time permits enjoy a 'light & sound Panorama' in Thirumala Naik Temple (optional) or visit to Alagar hills & Thirupura Rock Temple.Overnight at Madurai. Breakfast at hotel. Full day excursion to Rameshwaram, a city of swell and gentle sand dunes, embellished with the delicacy of casurina trees and stark palms. This is a sacred place for Hindus since according to Ramayana, this where Lord Rama worshipped God Shiva to absolve himself of the sin of killing. Return to Madurai by evening. Overnight at hotel. Breakfast at hotel. Proceed to Kanyakumari - the southern tip where the Indian subcontinent meets the sea. Proceed for the sunset view against the sea - An Unforgettable View. Leave for Trivandrum by surface and reach late evening. Relax at hotel. Overnight at Trivandrum. Breakfast at hotel. Start tour in the morning visiting the Sree Padmanabha Swami Temple and Kanakakunnu Palace. Proceed to the backwaters of Alleppey where you will board the Luxurious Traditional Houseboat, which is a fabulous way to explore the fascinating beauty of the backwaters for a memorable day & night cruise. The boat will take you through the virgin villages of Kuttanad - the only location in Kerala situated below sea level. By evening the boat will be anchored at the middle of the water column. Enjoy a starry night stay in between blue waters & blue skies. Overnight on board the houseboat. Breakfast at hotel. Transfer to airport for flight to Mumbai. On arrival meet and transfer to Hotel. Later enjoy sight seeing tour of Bombay, drive to Gateway of India and from here cruise by motorboats to Elephanta Caves. A flight of 100 steps takes you to the top of the hill where it is set. The caves houses large pillars that seem to hold the ceiling which is made of cross beams. The picturesque presentations of the 9 marvelous sculptured panels, set on the walls are awe-inspiring. The most famous of the panels is the Trimurthi, or triple-headed Shiva, where the God is depicted as the destroyer, the preserver and the creator. Later visit Prince of Wales Museum, Parliament House, Marine Drive, Jain Temple, Hanging Gardens, Colour ful Craford market. Overnight at Hotel. Note: Elephanta Caves and Prince of Wales museum are closed on every Monday. Morning at leisure. Day is free for your own activities. In time transfer to International Airport for your flight back to home.